I am that's who. I should say buttons...thanks to my blogging friend Carol who gave me a ton of buttons that were given to her from a friend. I have a little give away at the end of this post, but first I've made something else with my collection. In the past, I've made button thumb tacks and button magnets for the refrigerator or the magnetic board and now I've made a button frame!! I just took any one of the frames that I know we all have tucked away in a box. I painted this wooden frame black so the wood wouldn't show through all the black buttons. spaceI started hot gluing them in the corner in no certain order. Then I kept on layering all the way around. Keep going until it looks like this. all those glue blobs just slide right off. See that mess off to the right? Now the pad is clean as a whistle. This is a great project to use up all those button in the button box. It would also look cute with multi colored buttons too or all shades of pink and white or blue and white for a frame in a little boy or girl's room. The caption under the picture could say "I'm cute as a button"
GIVE AWAY IS CLOSED...Now it's time for a little give away. Carol was gracious enough to give me so many buttons, I would like to share some with you. Just leave a comment here and I'll pick a winner next Sunday. I'll try and squeeze in enough buttons to fill a small flat rate box or envelope. Sorry for the flat rate, but those little buttons are heavy when you put them all together. What a really cute frame. I was thinking if you don't have enough buttons of one color, just glue them all on and then spray paint the whole things. I love the suggestion for the glue gun, that's definitely a keeper. Thanks for the ideas and inspiration. I love buttons!!! That's a great-looking picture frame. Such a cute little frame. Sometimes it is more fun to use than to collect. I have some great ideas for buttons - and will be doing some of your button magnets too! Thanks for all your great ideas -- I would love to win some buttons! Very cute frame. And I love your tip on the silicone pot holder! I am a button lover too! I'm a fan, of yours and of buttons! Thanks! Very cute frame! Love the idea for the silicone mat! Flat rate is the way to go when shipping anything heavy! Perhaps I should email my home address now since I just know I'll win this one, and I'm leaving for a 4 day trip to NYC with my older daughter the day after you do the drawing. Such confidence! Anyway, any suggestions for where to go, what to see or where to eat when we are in NYC? For some reason, I think you live not too far from there. I'm liking the idea "Cute as a button". Hmmmmm - makes me think of using baby buttons or pastel letters. Karen, you come up with such fun ideas. Button - button - WHO wants the buttons? I'm sure many of us do. Thank you for such a fun chance. Hey, it is not Tuesday, cute frame! thanks for the chance to win. your frame looks great. So cut frame and thanks for the hot glue gun tip. Your buttons frame is really cute. 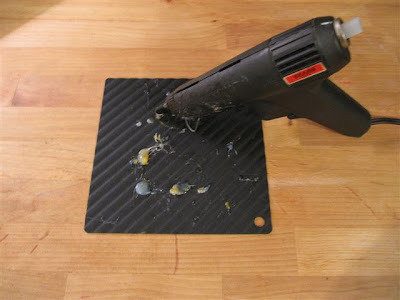 What I really loved was your hint on using the silicone pad for the hot glue gun. Your frame turned out great! I appreciate the extra bonus tip for the silicone hot pad. Good idea! Great tip for the glue gun mat! Thanks for the opportunity to win the buttons. I LOVE buttons! So it would be great to win your Giveaway. I love buttons. They remind me of my childhood and playing with my grandmother's button box. I would love to win your buttons. 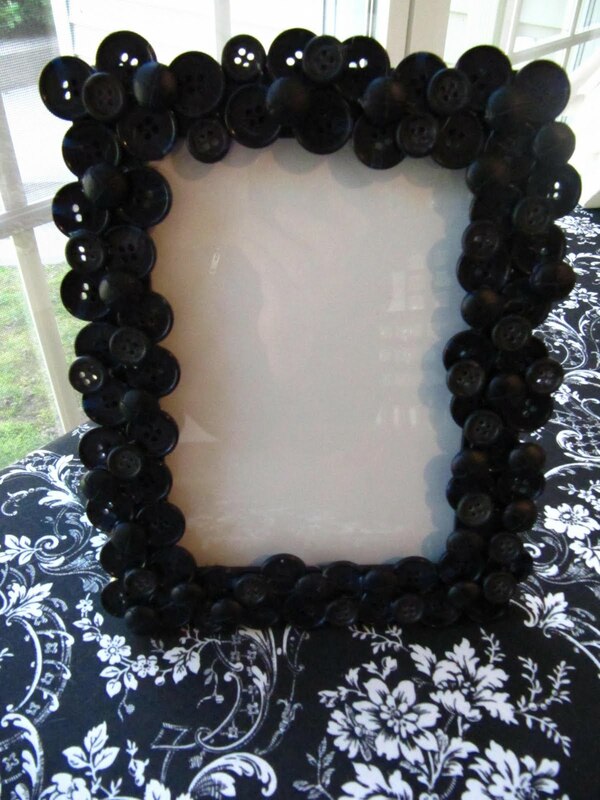 I have a good friend who's last name is button so the frame would be a great gift idea for her. This is a very cute idea. I have to file it away on my "someday" list. Maybe if I win the buttons it will be on my "this season" list :-). thanks! What a great idea and what a great frame. Karen, what a fantastic idea, you've inspired me to do the same ! I love the button frame. What a great idea. Good point about the glue gun. I have a nice red silicone pad that would work wonderfully. ohh...I love buttons. Thanks for the top on the hot glue gun, love the easy clean up. Very nice! If you didn't have enough black buttons, I bet you could just use any color and spray paint them all black. I love your button idea! Oh I hope I win! I'm always looking for the right button to use, and need alot of them to make me a couple of frames! So cute. Love the frame! Great idea. I absolutely adore buttons - any shape, any size, any colour. They look good in jars on my shelf, can be used for all types of projects and decorations, and they are practical. Perfect! Fingers crossed - I would love to win them! Thanks for doing this give-away. You have some really great and creative ideas. Karen - this is such a great idea. I have a nice who is "cute as a button" and this would be a great gift for her upcoming birthday. Please pick me for the freebie! Thanks for being so innovative! That frame is so cute! What a great idea! The frame is so cute!!! I have a ton of buttons ............ just maybe............!!! 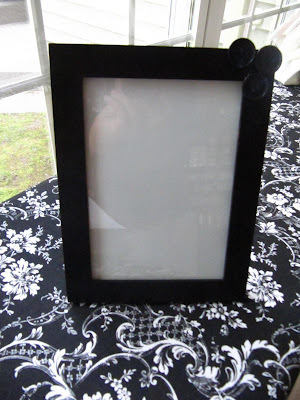 What a fantastic way to dress up a plain frame! I love it. The tip for the hot glue gun is just wonderful. I think that I have some buttons that I can make myself a frame with. Thanks, Karen! Karen, the frame is so cute! And I am a huge button fan :-) Love those buttons! Thanks for sharing. I am crazy over buttons and use them on any project I can think of. I even used them on my Christmas cards that I printed on my computer for buttons on Santa's suit. I would love to win more buttons to and to my stash. My Gram collected buttons. I remember jars of them in her sewing room. I wish I had them. This would be a great way to start my own collection. Thanks for the chance! Very cute frame! That's a lot of buttons! Thanks for the tip for the glue gun. I'm always getting drops on my counters! Loved the frame! A great gift idea! Buttons are great! Hello Karen, what a wonderful idea.Have a happy day. That is way too cute. I hope I'm your lucky winner!! 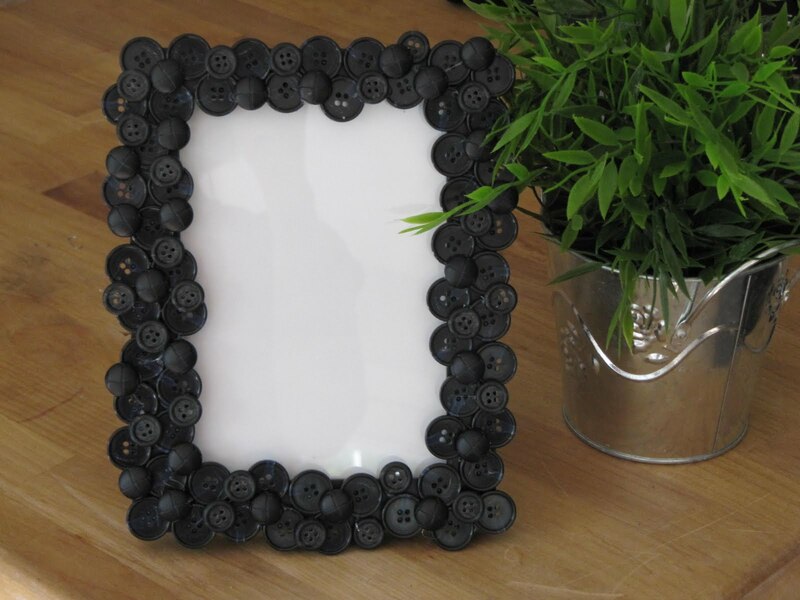 I'm Miss Buttons, I'm addict to them, love the frame you made! Cute! I love buttons, please enter me in your drawing. One can never have enough buttons. And these are lovely. I'm so impressed with what you created. Love it! Inspiring. Now I'm going to have to make one, or maybe quite a few, too! PS - I also love flat rate shipping. My primary way to ship anything! That frame is adorable!! I would love to enter your giveaway for some buttons. Thanks for the giveaway.. I LOVE buttons!!! Sure could use them, hope I win!!! I helped my youngest son make a button picture frame for his sister for Christmas 2 years ago. She loves it and he still remembers making it for her. I love buttons and need more to add to my collection. 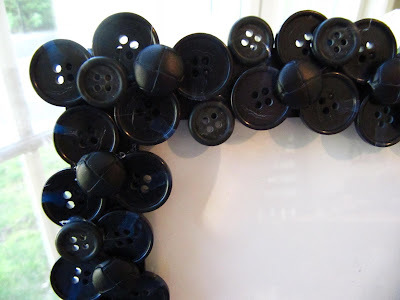 Love the button frame idea! I agree. A girl can never have too many buttons. Off to explore your blog. Thanks so much for the generous give away and the chance to win. Absolutely love the frame. Must remember to make one of these! I really love the button frame, it is so cute. I have just started to use black to decorate with. What a cute frame. Please include me in your giveaway. Thanks. I love this frame. I think I will have to try that. Would love to win more buttons to use. I love reading about your ideas for things. I would love to win some buttons! Wow! buttons! Love the frame idea and love the chance to win more buttons! I only have 2 medium sized tins full. Your frame is a fun way to show off some buttons. One with bright buttons would be a great frame for a fun kid's birthday picture. What a creative idea! I love it! Please include me in your giveaway. button(s), I'd love to have some. I saw the frame and wished I had not given away all my button collection. Darn. Maybe I should start one back up again. What a great idea! Please count me in. Thanks for the chance! Flat rate is smart sense! Do you have that many to fill a flat rate envelope or box??? yowza that's alot of buttons! I love that frame, but don't have enough buttons to do that with them. Would love to win some button love! Karen, what a cute little frame! Cute as a button! I'm going to have to make one. I adore buttons! Would love to winyour giveaway, it would definately start me into a "new craft phase". You are such an inspiration! Thank you for all the great, fun ideas. If you are taking international entries, I'd love to start a button collection. So cute!!! The buttons look great and I love the tip about the hot glue gun glue catcher. Thanks!! Love buttons! Cute frame idea. 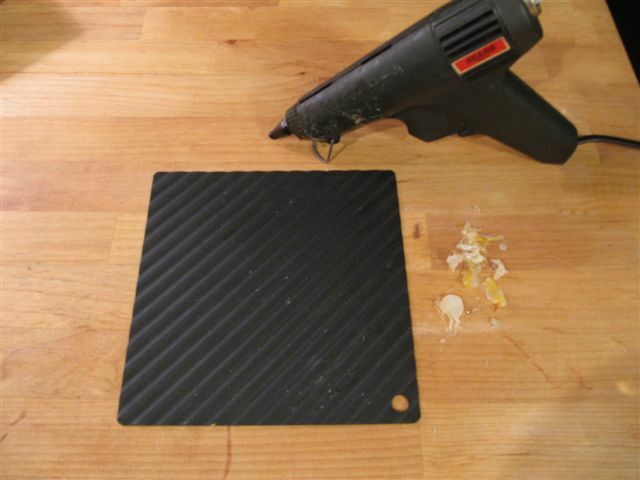 Great tip about the glue gun pad. 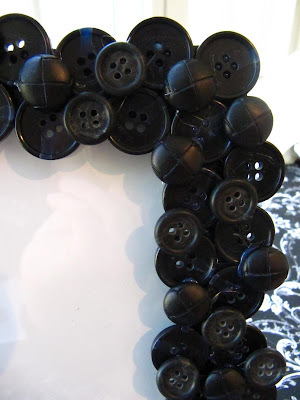 I love buttons, cute frame idea too! Oh my gosh, I LOVE buttons. I can never have too many. Thx for the great giveaway. Love the frame idea and love the chance to win more buttons! Love the frain aidea! I might even buy a glue gun when I would win these buttons as I really love to give this a try! what a great idea a frame with buttons, I will certainly try to make this one. The frame is so cute! You come up with such clever ideas on your blog and I really enjoy your Tool Time Tuesday projects. Thanks for all your inspiration. I would love buttons! I'm a new follower. I found you through a friends blog, and let me just say, I had recently thinking I have all these extra craft things sitting around, and nothing to do with them. Now I at least have a cute frame to make for pictures of my kiddos! I don't have quite so many buttons in my collection yet, but probably enough to make 1 small frame. What a cute idea for the button frame! I would love to be the one to "share" your buttons....very generous of you. I love the button frame, and this week's tool time idea is great! Thanks! I love buttons! I collect them and realy don't know what to do with them.I have them in jars , put some on quilts and even pins. What a great idea!I love buttons! Cute frame. I love all your tips and ideas. And if I win the buttons, I'll be using a few more of your ideas. :) Thanks for the giveaway--they are always fun to enter. Cool frame idea - thanks for sharing! What an adorable frame!! I hope I win your button give away ...what a head start to my very own button collection it would be ...thanks for the chance!! Another terrific project (with extra little tips throughout). I want you to know I walk thru all the hardware stores with you in mind these days. Would love to win your buttons! You need a TV show. You come up with the greatest ideas with stuff lots of people would throw away( my husband LOL) as junk.I look forward to Tuesdays! Karen, you did it again! Love the idea of a frame all buttoned up. You rock!!!!! I really do like your TTT. I try to remember to check your blog on Wednesdays so I don't miss a single one. And buttons ... well who doesn't like a load of buttons. I have used some of my Mom's old buttons on a quilt. I love seeing and touching them now that she is gone. I just love your imagination! You have so many neat ideas. Thanks for sharing. I have jars of buttons that I just love to pull out and play with. And every once in a while I actually have a use for them. My favorite button possession, tho, is an old candy box full of buttons that my aunt Lil (who just passed away at 93) found in a little house in my home town that they bought to stay in when they visited. Lots of bone buttons with big holes that my Dad identified as "underwear buttons." And a grade school picture of the guy who is currently one of ND's senators. Must have been a relative's house, because they (the senator's family) moved away when I was quite small. If I win, I'll have to send you a couple to add to your collection! My mom had an old Crisco can filled with buttons that we kids would pull out and play with when we were little. And, my grandma crocheted all of her female grandchildren button bracelets using elastic cord. Gee -- didn't realize I could pull up so many button memories in just a few minutes! What a great idea! I love this frame - it reminds me of one I made with painted puzzle pieces used in the same way. This looks lovely! Love the frame. Doing it all in black makes it look elegant and sophisticated. Great work. Would love to win the buttons. What a cool picture frame! And I love the tip about the glue gun and the silicon potholder. I would LOVE some buttons. My nine-month-old creates more pictures then I have time to find frames for and this would be a GREAT gift this Christmas. I love your creativity, you're a genious. I am getting started with buttons. I want to win, pick me, pick me. What a great idea....my friend's daughter is having a baby any day now and that would be a great gift. Thanks for all of your ideas...keep them coming. I love this page! I have been a button fanatic since I was very little! My mom used to clean out my pockets to wash my clothes and she would say where in the world do you get all these buttons from! I had a while glass jar full I had been saving for years but sad to say a few years ago during a move the movers misplaced them never to be seen again. So now I am starting a new one! Hope I win! BTW the frame is awesome. Going to make mine black as well but with random reds scattered! Will send u a pic! See you soon,Pepper!